Dear intestines: Make up your mind. Thx. In a mere 48 hours, I’ve gone from nearly shitting my pants to no movement AT ALL. Thanks pregnancy! I’ve only ever suffered from the big “C” once. It was not pretty. In non poop news…I made an appointment at the clinic that utilizes the hospital we want to go to. I feel bad not seeing the NP I’ve been seeing for YEARS for my first appointment, but it seems like I should start out at the clinic right off the bat. Oh well. This new clinic has the choice of seeing a set of doctors or midwives. GREAT. Another decision. I had always assumed doctor, but now I don’t know. Le sigh. Also – I’m pretty much going INSANE not telling anyone about the babe. I REALLY REALLY want to wait, but not telling is almost killing me. I’m going to have another chat with the hubs tonight and see what he thinks. I’m tired of lying and having this great news and not being able to share it with anyone!! The reveal to the inlaws. I don’t know if I’ll keep this up forever, but I’ll post it for now. Telling the in-laws from jenna bee on Vimeo. See below for an explanation of wtf is going on in this video. Get out of my head, you bad thoughts, you. For some reason today, I’m overcome with thoughts that something is wrong and this baby won’t be born. I can’t stop thinking about it. I mean, I still feel effed up and that’s good, but I feel like I’m going to go to that appointment in 2 weeks and they’re going to tell me that there’s no heartbeat or that something is awry. I can’t shake it either. I suppose everyone feels this way once in a while while pregnant, but I wish I could make it go away. Total weight gain/loss: minus 2 lbs. Maternity clothes? No. 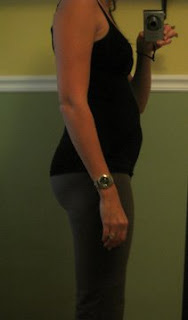 Although after sweating non-stop for the past 3 days, I’m wondering why polyester maternity clothing is even allowed. Sleep: Aside from my kitty being a dickhead, been sleeping well. VERY weird dreams though. Movement: Yes. Plenty of it in my bowels. Gender: I haven’t even thought about it. I’m kind of not letting myself think about it. Weekly Wisdom: Read my post below – get over pooping in public restrooms. Just get over it. Milestones: Nearly crapping my pants. Not a good milestone.